Turn your lamps on or off with just a touch! With just a tap of your finger you can turn your lamp on or off! 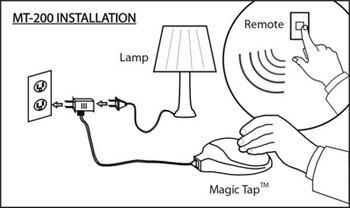 Or, you can use the Magic Tap to adjust the brightness of your lamp with just a tap. Adjusts your lamp's light from dim, medium to bright. 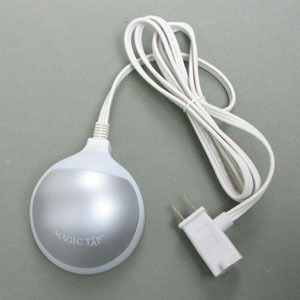 The unit with the remote control can be used both ways; a touch to the Magic Dimmer or by the remote control. The Remote control has an operational range of 50 feet. 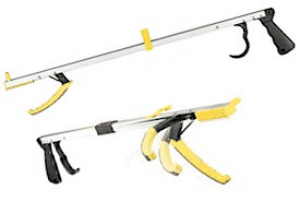 Great for any room in your house. You can convert any standard plug-in lamp into a Magic Tap Dimmer Lamp by plugging in the the touch dimmer into your regular wall socket and then plugging your lamp into the dimmer. EASY - set up in less than 5 minutes! The touch dimmer also includes a night light so you'll be able to locate your dimmer control in the dark. Click "More Pictures" above to view a drawing of the set up.